REGIONAL NEWS - AFRICA 22 E&MJ • NOVEMBER 2017 www.e-mj.com structure and underground development already in place have been useful in de- veloping the new underground mine on the West Reef deposit. Barrick, Tanzania Reach Agreement in Acacia Dispute After months of back and forth, Barrick Gold Corp. and the government of Tanzania have agreed on a framework for a new part- nership between Acacia Mining plc and the government where economic benefits from Acacia would be shared with Tanzania on a 50/50 basis. The framework was signed on October 19 in Dar es Salaam following a meeting between Barrick Executive Chair- man John L. Thornton and the President of the United Republic of Tanzania His Excel- lency Dr. John P. Magufuli. Barrick, which holds a 63.9% interest in Acacia, and the government of Tanzania have also agreed to form a working group that will focus on the resolution of out- standing tax claims against Acacia. Under this proposal, as a gesture of good faith, Acacia would make a payment of $300 million to the government with payment terms to be settled by the working group. Acacia said it has received a copy of the framework agreement and is seeking further clarification. No formal proposal, however, has been put to Acacia for consideration at this point in time. And, any proposal agreed in principle between Barrick and the gov- ernment will require Acacia's approval. Key terms of the proposal include: • A new Tanzanian operating company will be created to manage Bulyanhulu, Buzwagi and North Mara, and all future operations in the country. The principle of total transparency between partners will define how this company operates. For instance, the government of Tanza- nia will participate in decisions related to operations, investment, planning, procurement and marketing. • This company will maximize employ- ment of Tanzanians, building local ca- pacity at all levels of the business, from board membership to operations. It will also increase procurement of goods and services within Tanzania. Barrick has also committed to work with the gov- ernment of Tanzania to advance con- cepts for increasing in-country benefici- ation of gold. • Economic benefits from Bulyanhulu, Buzwagi, and North Mara would be distributed on a 50/50 basis between the new operating company and the gov- ernment of Tanzania. The government's share of economic benefits would be de- livered in the form of royalties, taxes and a 16% free carry interest in the Tanzanian operations. • In support of the working group's on going efforts to resolve outstanding tax claims, Acacia will make a payment of $300 million to the government of Tan- zania, on terms to be settled by the working group. • Barrick and the government of Tanza- nia are also reviewing conditions for the lifting of the country's concentrate export ban. 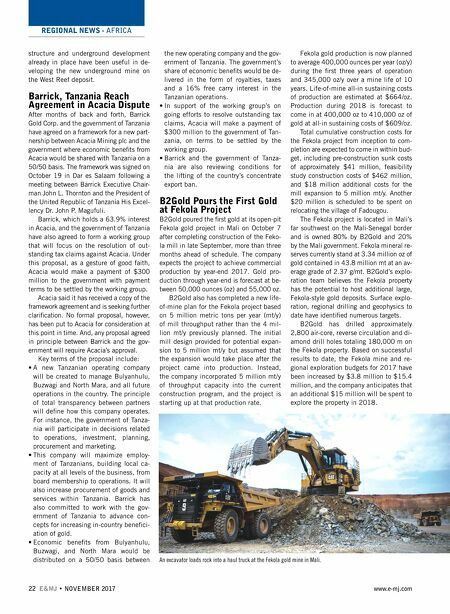 B2Gold Pours the First Gold at Fekola Project B2Gold poured the first gold at its open-pit Fekola gold project in Mali on October 7 after completing construction of the Feko- la mill in late September, more than three months ahead of schedule. The company expects the project to achieve commercial production by year-end 2017. 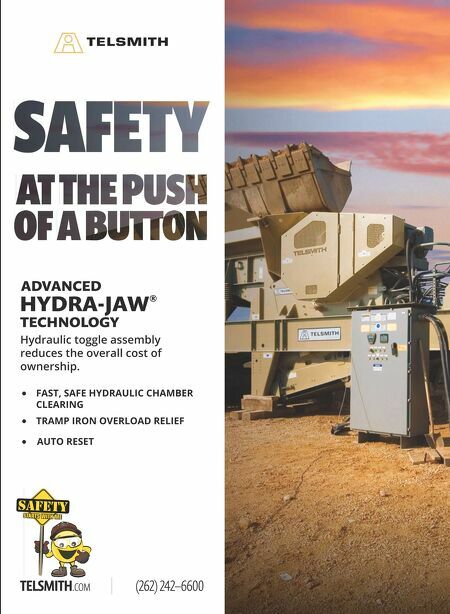 Gold pro- duction through year-end is forecast at be- tween 50,000 ounces (oz) and 55,000 oz. B2Gold also has completed a new life- of-mine plan for the Fekola project based on 5 million metric tons per year (mt/y) of mill throughput rather than the 4 mil- lion mt/y previously planned. The initial mill design provided for potential expan- sion to 5 million mt/y but assumed that the expansion would take place after the project came into production. Instead, the company incorporated 5 million mt/y of throughput capacity into the current construction program, and the project is starting up at that production rate. Fekola gold production is now planned to average 400,000 ounces per year (oz/y) during the first three years of operation and 345,000 oz/y over a mine life of 10 years. Life-of-mine all-in sustaining costs of production are estimated at $664/oz. Production during 2018 is forecast to come in at 400,000 oz to 410,000 oz of gold at all-in sustaining costs of $609/oz. Total cumulative construction costs for the Fekola project from inception to com- pletion are expected to come in within bud- get, including pre-construction sunk costs of approximately $41 million, feasibility study construction costs of $462 million, and $18 million additional costs for the mill expansion to 5 million mt/y. Another $20 million is scheduled to be spent on relocating the village of Fadougou. The Fekola project is located in Mali's far southwest on the Mali-Senegal border and is owned 80% by B2Gold and 20% by the Mali government. Fekola mineral re- serves currently stand at 3.34 million oz of gold contained in 43.8 million mt at an av- erage grade of 2.37 g/mt. B2Gold's explo- ration team believes the Fekola property has the potential to host additional large, Fekola-style gold deposits. Surface explo- ration, regional drilling and geophysics to date have identified numerous targets. B2Gold has drilled approximately 2,800 air-core, reverse circulation and di- amond drill holes totaling 180,000 m on the Fekola property. Based on successful results to date, the Fekola mine and re- gional exploration budgets for 2017 have been increased by $3.8 million to $15.4 million, and the company anticipates that an additional $15 million will be spent to explore the property in 2018. An excavator loads rock into a haul truck at the Fekola gold mine in Mali.